Of all the end mills available to machinists, by far the most popular are those with a 3/8″ shank. 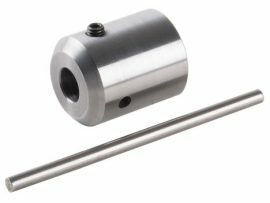 Because they are made and sold in great quantities, they are an economical alternative to the smaller but less often used miniature series end mills. They also offer the advantage of being double-ended, so you get twice the cutter for your money. 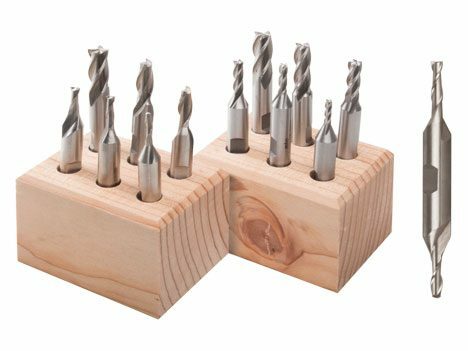 Each has a flat on the side against which the set screw of the end mill holder is tightened to hold it in place. Sherline offers two sets of six double-ended cutters. Both sets include sizes 1/8″, 5/32″, 3/16″, 1/4″, 5/16″ and 3/8″. (Remember, when cutting in a pocket, the corner radius left by your cutter will be half the cutter diameter.) P/N 7400 is made up of 2-flute cutters, while 7401 offers 4-flute cutters. 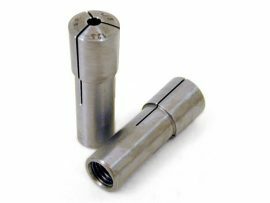 The 2-flute cutters are recommended for softer materials like aluminum where they are less likely to become clogged. 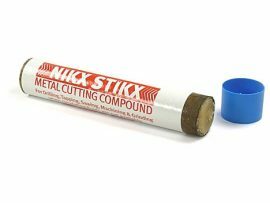 For cutting tougher metals like steel, 4-flute cutters are a good choice. Each set comes with a wooden block to protect and store your cutters. CAUTION: Unlike a drill bit that looks similar, end mills are sharpened on the edges as well as the tip. These sharp edges demand a lot of respect when being handled and used! Also, to keep them sharp, store them in the block provided or individually protected in your toolbox.